GMAW (mig welding) uses shielding gas to protect the weld puddle from the atmosphere while in a molten state. This is general knowledge, but many in our industry believe this is the only function of the shielding gas. Shielding gases can affect welding in many different ways and an evaluation of your current choice of shielding gas may be due. Argon/carbon dioxide gas shielding mixtures are the most common. A change can be as simple as going to a different content mix, such as switching from 90/10 to 75/25. Or it can mean going from an argon/carbon dioxide mix to an argon/oxygen mix, or going to 100% carbon dioxide. In some cases it also involves going to a trimix such as argon/helium/carbon dioxide. 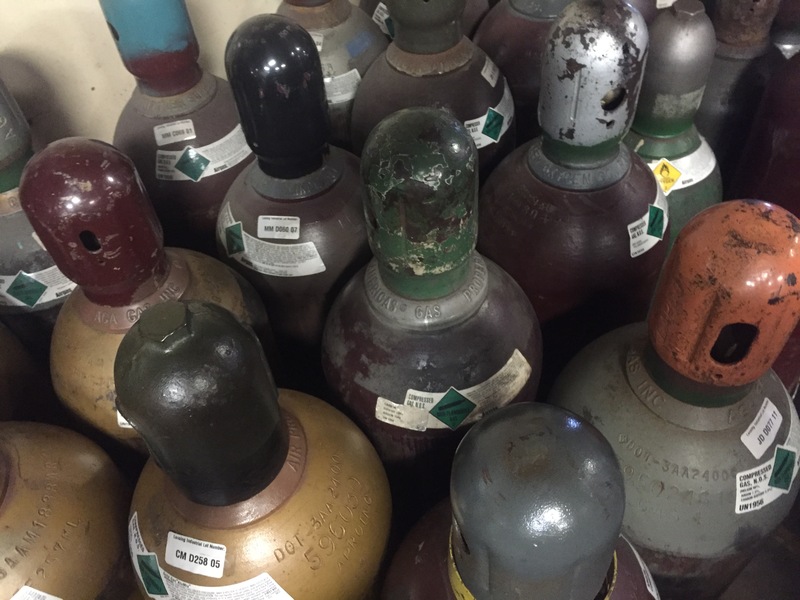 There are many different shielding gas mixtures available. Are you using the best one for your specific application? There is a reason why shielding gas is an essential variable in welding procedure specifications. Changing it can have a significant impact on your welds. Penetration profile – we are mainly concerned with getting proper penetration, but a broader (wider) penetration profile may be beneficial in some cases where the torch angle cannot be kept constant. Carbon dioxide provides this broader penetration profile. You do not need to go with 100% carbon dioxide. If you are using an argon rich mix (90% or more argon with the balance being carbon dioxide) consider an 85/15 or even 80/20 mix. Ability to handle mill scale and other contaminants – mill scale can prevent penetration and even fusion. This is another case where higher carbon dioxide content can be a solution. Carbon dioxide is an active gas and will perform better on rust and mill scale than a high argon content mix. To learn more about the difference between active and inert gases and their effects read Effects of Shielding Gases in GMAW. Spatter levels – the smoother the arc transfer the less spatter we’ll have. In this case higher argon content will allow us to get into a spray transfer and eliminate the spatter generated by the short arc and globular modes of transfer. You need at least 80% argon in your mixture. The higher the argon content the lower voltage needed, and in some cases lower amperage needed to get into a spray transfer. Bead profile – some gases will allow the bead to wet out and obtain a flatter face than others. Oxygen does a wonderful job of providing a flat face. But be careful, high amounts of oxygen can create a very deep but narrow penetration profile and may cause you to miss the root of a joint if your work angle changes more than just a few degrees. Rust prevention – when welding stainless we need to make sure our oxygen and/or carbon dioxide content does not exceed about 3%, otherwise our welds will rust prematurely. You can deposit a weld on stainless with a 90Ar/10CO2 gas and make it look ok, but the carbon that is introduced into the weld will bind with the chromium and reduce the material’s ability to prevent rust. Welding speed – different gases provide different levels of wettability, that is, how easily the weld flows and creates a smooth transition at the toes. Oxygen can help with this if you are welding on sheet metal. Cost – mixes vary in price depending on the content. If you weld with a 90/10 (argon/carbon dioxide) mix you may be able to reduce your costs is you switch to 85/15 or 80/20 while still achieving the desired results (appearance, penetration profile, spatter levels). If you are welding stainless with a trimix (helium, argon, carbon dioxide) you may be able to switch to a 98% argon 2% oxygen (or carbon dioxide) and still get the needed results. Fume levels – typically, active gases like carbon dioxide will generate higher fume levels than inert gases such as argon and helium. In general, the higher the carbon dioxide content the higher the fume generation will be. As you can see, our choice of shielding gas can have a tremendous impact on our application. Gas isn’t there just to prevent porosity; it can improve quality and productivity and at the same time reduce costs. Hi guys. Can you please explain oxygen as a shielding gas and the percentage you use. I was under the impression that oxygen is highly reactive or explosive if used wrong. Thank’s. I love the info that you guys put out there. hi again. I forgot to ask what process you would use oxygen for? Thanks again. Oxygen is most commonly used for GMAW (mig) welding. Oxygen is also used for oxy-fuel welding. This is a process similar to brazing. We do not use oxygen for GTAW (Tig) application as it is a reactive gas and GTAW must be done with inert gases. Hello Neil. Oxygen is not explosive. Oxygen is an oxidizer, which basically means it can accelerate burning. But without a fuel and source of ignition there is no fire. The air we breathe is composed of about 78% nitrogen, 21% oxygen and about 1% argon. Most welding shielding gases that use oxygen do not exceed a content of 5%. For mild steel you can use up to 5% oxygen and obtain acceptable results. For stainless steel most mixes limit oxygen to 2-3% to avoid oxidation (rust) of the stainless. Thank’s , I new about the oxy fuel welding I learnt that in my C level . That is a good skill to have under my belt. I just had never heard of it as a shielding gas. Thank’s for the info.